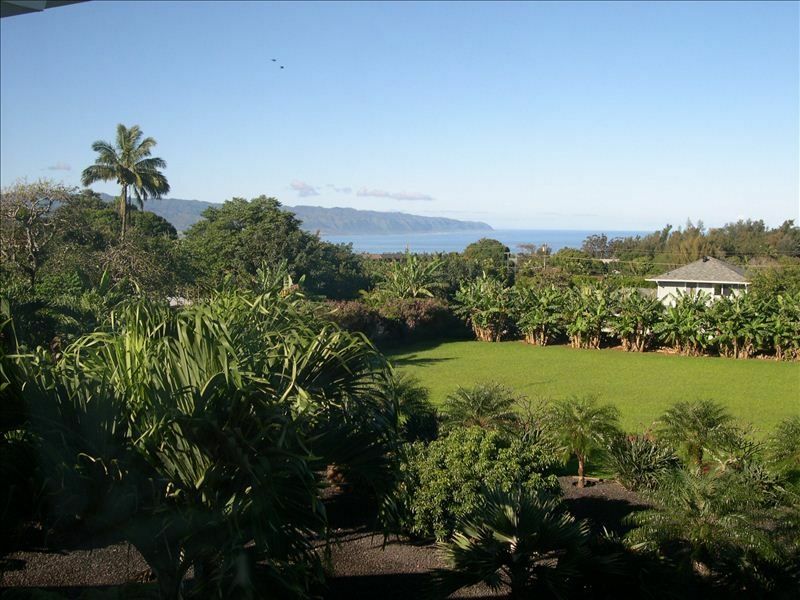 Visitez la côte nord d'Oahu et découvrez «Country Living» dans un domaine isolé d'un acre au-dessus de la baie de Waimea. Situé au sommet des montagnes de Pupukea, vos activités de randonnée à pied et à vélo seront renforcées par l'air frais des montagnes et le manque de circulation. L'appartement fait partie d'une parcelle d'un acre comprenant des jardins bien entretenus et une grande pelouse. Des fruits frais sont souvent disponibles sur place pour un petit-déjeuner. Vous trouverez une épicerie à service complet à proximité, desservie par une société de café de renommée nationale. Les restaurants sont abondants le long d'un corridor de 12 km appelé l'autoroute Kamehameha. Dans la ville historique voisine de Haleiwa, vous pouvez trouver plus de restaurants, restaurants à service complet, pharmacies, magasins de vêtements, bijoutiers, magasins de surf, raser la glace et art et artisanat locaux. Le port de plaisance de Haleiwa propose du poisson frais, la navigation de plaisance, le jet ski et la rencontre avec les requins. Devis par le site vrbo.com peut ne pas refléter le coût réel. S'il vous plaît contacter le propriétaire. Excellent accommodations and warm wonderful hosts. The triplex was clean and orderly. It had a well stocked kitchen, and ample living space for my family of 5. Having been to the North Shore several times before I expected many more insects and critters, but was pleasantly surprised. We did have a bit of rain, but the days were still enjoyable. The owners and the onsite care-giver we extremely helpful and hospitable, even making sure we were well stocked with fresh fruit upon our arrival and throughout or stay. We will definitely be returning and recommending this place in the future! First trip to Hawaii and using VRBO. We stayed 10 nights in the unit. The unit is short distance from everything the North Shore has to offer. It's easy access to beaches and activities and short drive away from the hustle and bustle. The owners were friendly, informative and helpful upon arrival. They are quick to return contact and to be available. FYI: There is extra contact and paperwork involved in the process after booking. Pictures posted on VRBO of the indoors are accurate and accommodations are cute, comfortable and adequate. Be advised there are stairs to climb. We purchased hangers to leave in the closets and left a clothes hamper as well, a Keurig coffee maker would have been especially helpful if you are only staying a short time. Sleeping for us was not comfortable here as the unit does not have air conditioning and there is one ceiling fan (on a timer max. 60 min.) in the main living room. Owners brought a fan at our request and there is a breeze that comes in at times but it is Hawaii; hot, sticky and humid. A window ac unit or/and ceiling fans in the bedroom spaces would have made sleeping and being in the unit much more comfortable. Be advised that this is not an entire house. When making our reservation I was under the impression it was a house and private. The description says House and does not indicate that you will be sharing the home/property with a full time tenant and tenets from another unit (if they are there) Each unit is attached on either side of the home with the full time tenant living in the middle. It was do-able but the property description should be updated to reflect this and would have changed my decision to book. The outside of the property in our opininon was not as picturesque as the photos; we were never able to see the ocean as it is pictured and as it states in the description. The grounds of the property were not kept up and there was clutter about the driveway and back of the grounds in spite of what it states and shows on the listing. We did not spend a lot of time on the grounds and were not home but the pictures of the grounds and views should be more realistic. There is little internet connection at best. Only able to use computers/phones down the mountain and not in the unit. I feel if it is going to be listed as an amenity it should work without problem. Over all ok for short stay but the listing could be more accurate. Light, bright space. There was no ocean view as somewhat indicated by this picture, due to the vegetation having grown higher. As well, the house was much further up the hill than I had anticipated, but this won't be an issue if you have a car. You certainly feel like you're up in nature (which you are). Noise was a bit of a problem for my travelling companion, as there was quite a loud voltage noise from the street lights, as well local bird noise (roosters, hens etc.). Although, I personally was not disturbed by the bird noise. I was, however, disappointed that I had to provide credit card information to the owner over the phone, in addition to a large damage deposit and another rental agreement, after booking online through VRBO. I would have preferred that this be made known on the VRBO listing prior to booking. We also had to make contact with the owner to get the WiFi password, so it wasn't entirely a "hands-off", friction-free experience as our other O'ahu rentals were. The place was suitable for a couple of nights, but ultimately there were few too many hoops to jump through after booking, which I wasn't expecting. It was very nice place for holiday in the middle of lush nature. Beautiful garden and homy house. Property was clean and well-maintained, owner provide good service. Foodland and beach are situated close to the property (by car). We loved out stay in Pupukea. The property is so peaceful and away from the tourist crowds. The roosters kept us awake at night but we got used to it. The addition of an iron and a tea pot would make it even better. There was a little confusion about check out time as all the correspondence stated check out was 11 AM which we were aiming for but then we were told it was 10 AM. It didn't turn out to be a problem but it would be nice if it was clearly stated as one time. Overall, a very nice stay!